Available in sizes ranging from 3 foot wide to 8 foot wide. Exterior finishes available are Powder Coated Steel, Stainless Steel or Polypropylene. Interior finished available are non-asbestos cement board, non-asbestos cement board with a white epoxy paint finish, white chemical resistant fume hood liner, stainless steel or polypropylene. Electrical and Plumbing fixtures are available to be shipped loose or pre-wired and pre-plumbed prior to shipment. Optional Magnehelic Gages are available to be pre-installed prior to shipment. Magnehelic Gages are used as an independent visual indication of airflow. Optional TSI variable air Volume fume Hood Controls can be shipped loose or preinstalled prior to shipment. Available in metal, wood, plastic laminate or Polypropylene. Multiple sizes and configurations are available with many types and finishes of hardware. Flammable Storage and Acid Storage base cabinets are also available. 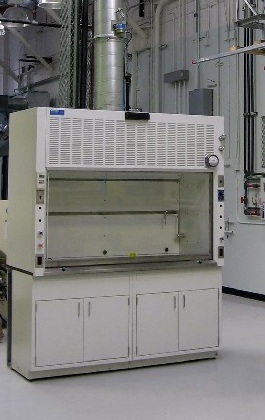 Bench top fume hood countertops should be epoxy resin dished countertops to provide containment in the fume hood (per NFPA 45 8.8.1.3 – 2004 Edition). Work surface countertops are available in epoxy resin, plastic laminate, Stainless Steel and Polypropylene. Standard fume hood countertops are 1-1/4" thick with a 3/8" deep dish for containment. Standard work surfaces are 1" thick. Other thicknesses are available upon request.